We don’t need charter schools. 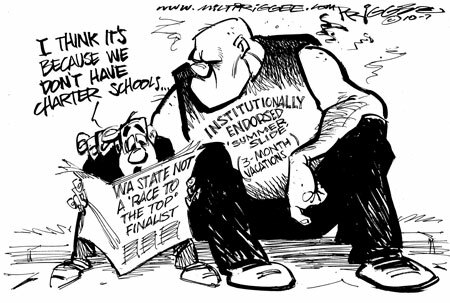 Charter schools did not cause WA State to “lose” Race to the Top Trough dollars. And, we can be creative with our school year. I’d love to see something like a nine week on, three week off model or a six week on, two week off model. Let’s leave the current calendar and eliminate that brain drain we call summer. We have the potential to improve attendance rates and, even more importantly, graduation rates. This entry was posted in Attendance, Graduation, Money on August 8, 2010 by drpezz. President Obama gave his speech to students today on C-SPAN, and I had not planned on having my students watch it since it’s not directly germane with the course of study; however, my students requested to watch it, and I let them. I don’t really understand the objections to Obama’s speech since his message was to become successful in school. This entry was posted in Attendance, Diplomas, Discipline, Dreams, Graduation, Lessons, Parents, Pop Culture, Snarky, Television on September 8, 2009 by drpezz. Stories are starting to be written about reducing the school week to four longer days rather than the current five day week (read about it here and here and here). Have you heard anything about this? Know anybody trying it? What do you think about it? lower transportation and overall costs. This entry was posted in Administration, Attendance, Money on January 27, 2009 by drpezz. If you have taught teenagers, then you know to expect sleepy students during the first periods of the day. While we may be apt to chide students for not getting enough sleep, researchers say this may be due to simple biology. Teenagers need 8-10 hours of sleep and tend to stay up late. In contrast, adults require around 6 hours of sleep and tend to go to sleep earlier. While we may be bright-eyed and perky at 8 am, our students may be struggling to keep their systems active as they fight the biological tendencies of their own bodies; their circadian rhythms change during puberty. In the linked article, one group of Kentucky high schools started school one hour later and the number of students getting 8 hours of sleep went up almost 15%. Automobile crash rates for teenagers in that area also declined while rising everywhere else in the state. Obviously, student activities and diet can affect their sleep patterns at night and their behavior in the morning, but moving the starting times of high schools one hour could help students be more productive and more safe. My school starts at 8:15 am, but we also offer extra courses at 7:00 am though they are rarely run because of too few students enrolling. We also have Monday late starts beginning at 9:45 am for students (7:45 am for teachers), but Mondays ironically enough have the highest tardy rates. Also, other effects would be felt. Sports and activities would run later, after-school jobs would be affected, and driving schedules could suffer for parents and students alike. Still, I wouldn’t mind trying this. This entry was posted in Attendance, Parents, Study on December 16, 2008 by drpezz. 5. Attendance Should Not Be a Part of a Student’s Grade. A student’s behaviors, like attendance, should not impact a student’s academic grade. The impact–positive or negative–of attendance will show itself during the assessments of the standards. Attendance could be a part of a citizenship grade. A school’s intervention system should be part of the accountability system for students. If a student purposely misses a class, the intervention system would then be used to provide the consequence outside of the classroom. Inside of the classroom the impact is felt when the student completes a standards-based assessment and when the student attempts to catch up on the missed work. Some activities cannot be recreated, and many teachers will not have the time (or the inclination?) to reteach a lesson purposely or inadvertently missed. I have always maintained that I don’t care the reason for a student’s absence. Either the student is present or the student is not; I can help those present and cannot help those who are absent. I do not track excused or unexcused absences. I just don’t care. I focus on helping the students when they are in my room. I always have two versions of every test, and almost every other assignment is written in a manner that an extra day or two makes little difference. The only question I want answered is this: can the student perform the skill or prove content mastery? I don’t use a participation grade based on attendance either. I don’t believe students should receive points for what they are supposed to do. To me, attendance is a basic expectation and will not be factored into a student’s grade. The results of attendance will be seen, much like a student’s homework completion rate, during assessment time. This entry was posted in Attendance, Grading on December 5, 2008 by drpezz. Classroom Assessment For Student Learning by Richard Stiggins, et al. Based on his research the presenter provided a number of points about how standards-based grading works, and these are the primary points I noted on my tablet as we discussed this new type of grading. 1. Student behaviors (effort, attendance, etc.) should not be a part of a student’s grades. 2. Late work does not result in a lower grade. 3. Extra credit should not be part of a student’s grade. 4. Academic dishonesty should not result in a lower grade. 6. Group scores should not be factored into individual grades. 7. Performance standards must be clear. 8. Grades should not be based on the mean. 9. Zeroes should not be factored into grades. 10. Homework should not be part of a student’s grade. 11. Grades should be based on more recent evidence. How do you feel about these eleven points? This entry was posted in Attendance, Cheating, Discipline, Extra Credit, Failures, Grading on November 29, 2008 by drpezz. Parents in a recent survey say teachers should stop blaming them for poor student performance. I agree to an extent. Parents are not 100% responsible for their students’ successes or failures, but they do have an enormous effect. I don’t necessarily think any one person or group is responsible, and the system itself may be the most culpable. Granted, people control the system; however, a concerted effort must be undertaken to change it. What do you feel are the biggest reasons for your students’ lack of success? This entry was posted in Attendance, Class Size, Failures, Parents on October 25, 2008 by drpezz.